Question: We've had a lot of attention on pedestrian accidents and Hawaii's crosswalk law. I understand the law gives pedestrians the right of way when they are in a crosswalk on the driver's half of the pavement. What about wide one-way streets, such as South King or Beretania? If I'm in the far-right lane and see a pedestrian waiting to cross on the left (and not being noticed by other motorists to my left), I would be creating quite a hazard by stopping (seemingly randomly to those behind me) for the pedestrian. Also, should I also stop if they're on the sidewalk next to the crosswalk? Can you print the law, or a link leading to it? Answer: Obviously, there is still a lot of confusion about the pedestrian safety law, updated in 2005. The rights and duties of pedestrians can be found in Chapter 291C-71 of the Hawaii Revised Statutes, with their rights of way in crosswalks spelled out in 291C-72. Specifically, 291C-72(a) says, "The driver of a vehicle shall stop and yield the right of way, to a pedestrian crossing the roadway within a crosswalk when the pedestrian is upon the half of the roadway upon which the vehicle is traveling, or when the pedestrian is approaching so closely from the opposite half of the roadway as to be in danger." We explained the law previously -- (Kokua Line, Sep. 25, 2005) . Honolulu Police Department spokesman Capt. Frank Fujii says motorists are required to stop if the pedestrian is on their half of the roadway, one-way or divided, and motorists are not required to stop if the pedestrian is waiting on the sidewalk. In both cases, both pedestrians and motorists should be cautious and use common sense. 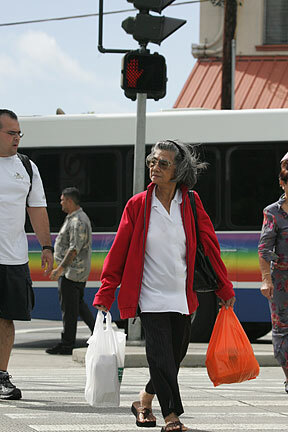 A pedestrian in a crosswalk at the intersection of Beretania and King streets glances over her shoulder at nearby cars. We received nearly two dozen calls in response to a reader's offer of Campbell's soup labels to any school or organization (Kokua Line, Jan. 30). As requested by the donor, we passed on the names of the first two callers. Other readers might consider collecting the labels -- only the UPC code on the label is now needed -- from various Campbell's products as a fairly painless way to help a school or organization. Some schools also participate in General Mills' Box Tops for Education (www.boxtops4education.com). Callers told us these schools collect Campbell's labels: Aina Haina School; Hongwanji Mission School; Ka'elepulu Elementary School; Kaewai Elementary School; Kahala School; Kaimuki Christian School; Kapunahala School; Manoa School; Our Lady of Good Counsel School; Pauoa Elementary School; Royal School; St. Anthony's School; St. Theresa's School; Voyager Charter School; Waialae Elementary School; and Windward Nazarene Academy. Also, the Aloha Grandmothers Club (c/o Gerri Lee, president, 2109 Metcalf St., Honolulu 96822) collects labels for a mainland care group that benefits children with cancer.